First commissioned in 1971, the plant consists of six boiling water reactors (BWR). These light water reactors drove electrical generators with a combined power of 4.7 GWe, making Fukushima Daiichi one of the 15 largest nuclear power stations in the world. Fukushima I was the first nuclear plant to be constructed and run entirely by the Tokyo Electric Power Company (TEPCO). Unit 1 is a 439 MWe type (BWR3) reactor constructed in July 1967. It commenced commercial electrical production on 26 March 1971. Units 2 and 3 are both 784 MWe type BWR-4 reactors, Unit 2 commenced operating in July 1974 and Unit 3 in March 1976. The design basis for all units ranged from 0.42 g (4.12 m/s2) to 0.46 g (4.52 m/s2). Units 1–5 have a Mark 1 type (light bulb torus) containment structure, Unit 6 has Mark 2 type (over/under) containment structure. From September 2010, Unit 3 has been partially fuelled by mixed-oxide (MOX) fuel. The Fukushima Daiichi nuclear power complex was central to a falsified-records scandal that led to the departure of a number of senior executives of TEPCO. It also led to disclosures of previously unreported problems at the plant. In 2002, TEPCO admitted it had falsified safety records at the No. 1 reactor at Fukushima Daiichi. As a result of the scandal and a fuel leak at Fukushima, the company had to shut down all of its 17 nuclear reactors to take responsibility. A power board distributing electricity to a reactor’s temperature control valves was not examined for 11 years. Inspections did not cover devices related to cooling systems, such as water pump motors and diesel generators. 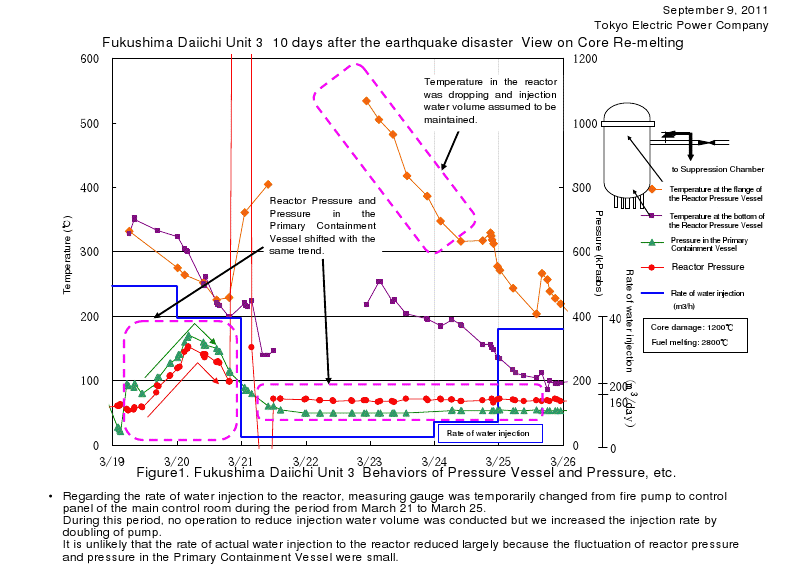 View on Core Re-melting - Temperature in the reactor was dropping and injection water volume assumed to be maintained. 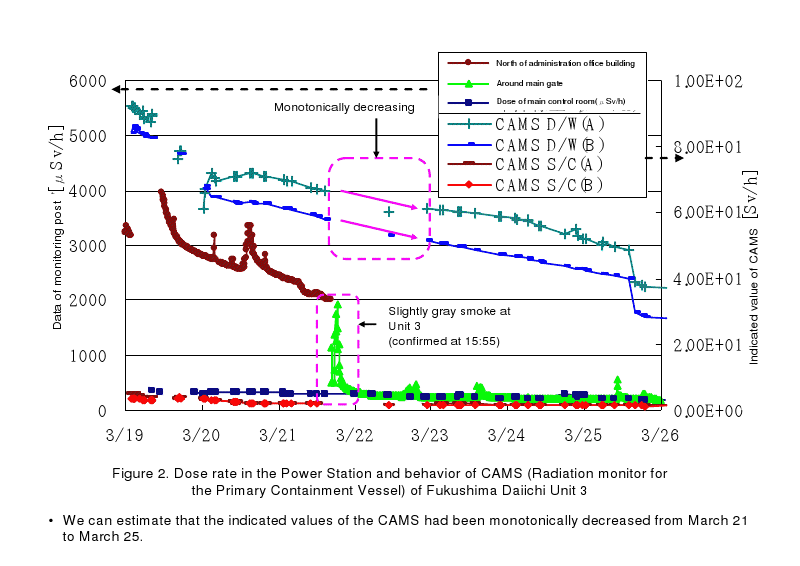 Slightly gray smoke at Unit 3 (confirmed at 15:55) - We can estimate that the indicated values of the CAMS had been monotonically decreased from March 21 to March 25. 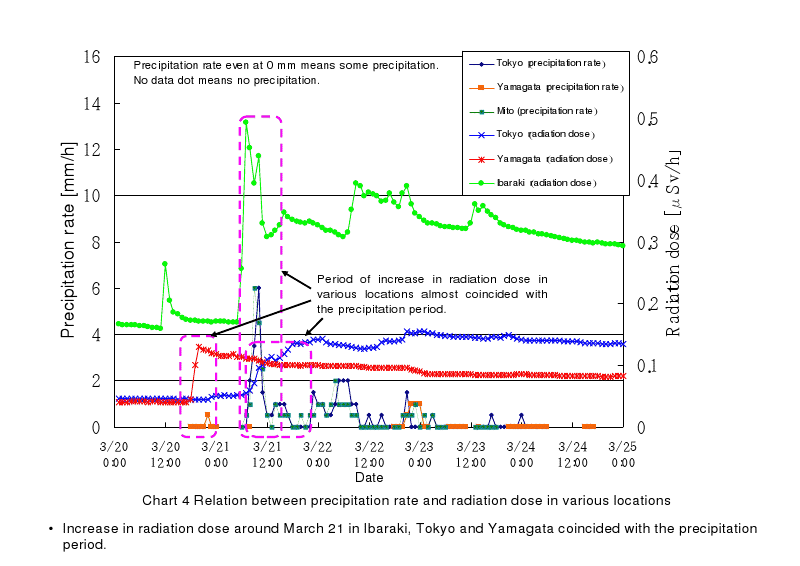 Increase in radiation dose around March 21 in Ibaraki, Tokyo and Yamagata coincided with the precipitation period. Grid power was restored to parts of the plant on 20 March, but machinery for Reactors 1 through 4, damaged by floods, fires and explosions, remained inoperable. Reactor Unit 3 (right) and Unit 4 (left) on 16 March. Three of the reactors at Fukushima Daiichi overheated, causing meltdowns which released large amounts ofradioactive material into the air. Unlike the other five reactor units, reactor 3 ran on mixed core, containing both uranium fuel and mixed uranium and plutonium oxide, or MOX fuel (with the core comprising ~6% MOX fuel). On 13 March, the HPCI system failed, the reason for which is not completely clear due to instrumentation not being available however it is believed to be due to loss of DC power due to depletion of batteries. After this the operators were unable to start the RCIC system and began injecting seawater. Although it was not clear at the time, some of the fuel in Reactor 3 apparently melted around sixty hours after the earthquake (the night of the 12th to 13th). Early on 13 March an official of the Japan Nuclear and Industrial Safety Agency (NISA) told at a news conference that the emergency cooling system of Unit 3 had failed, spurring an urgent search for a means to supply cooling water to the reactor vessel in order to prevent a meltdown of its reactor core. At 05:38 there was no means of adding coolant to the reactor, owing to loss of power. Work to restore power and to vent excessive pressure continued. At one point, the top three meters of the uranium/mixed oxide (MOX) fuel rods were not covered by coolant. At 07:30 JST, TEPCO prepared to release radioactive steam, indicating that “the amount of radiation to be released would be small and not of a level that would affect human health” and manual venting took place at 08:41 and 09:20. At 09:25 JST on 13 March, operators began injecting water containing boric acid into the primary containment vessel (PCV) via the pump of a fire truck. When water levels continued to fall and pressure to rise, the injected water was switched to seawater at 13:12. 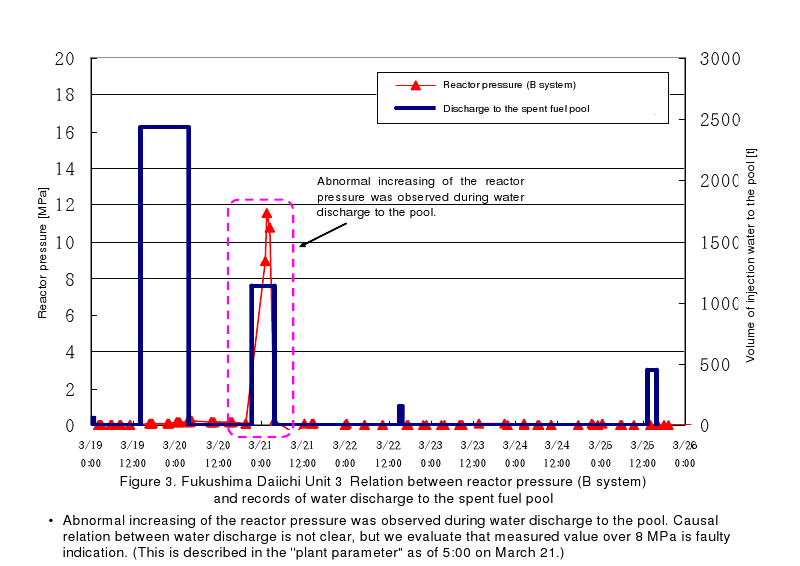 By 15:00 it was noted that despite adding water the level in the reactor did not rise and radiation had increased. A rise was eventually recorded but the level stuck at 2 m below the top of reactor core. Other readings suggested that this could not be the case and the gauge was malfunctioning. [quote]Injection of seawater into the primary containment vessel (PCV) was discontinued at 01:10 on 14 March because all the water in the reserve pool had been used up. Supplies were restored by 03:20 and injection of water resumed. On the morning of 15 March, Secretary Edano announced that according to TEPCO, at one location near reactor Units 3 and 4, radiation at an equivalent dose rate of 400 mSv/h was detected. 12:33 JST on 13 March, the chief spokesman of the Japanese government, Yukio Edano said hydrogen gas was building up inside the outer building of Unit 3 just as had occurred in Unit 1, threatening the same kind of explosion. 11:15 JST on 14 March, the envisaged explosion of the building surrounding Reactor 3 of Fukushima 1 occurred, owing to the ignition of built up hydrogen gas. The Nuclear and Industrial Safety Agency of Japan (NISA) reported, as with Unit 1, the top section of the reactor building was blown apart, but the inner containment vessel was not breached. The explosion was larger than that in Unit 1 and felt 40 kilometers away. Pressure readings within the reactor remained steady at around 380 kPa at 11:13 and 360 kPa at 11:55 compared to nominal levels of 400 kPa and a maximum recorded of 840 kPa. Water injection continued. Dose rates of 0.05 mSv/h were recorded in the service hall and of 0.02 mSv/h at the plant entrance. Eleven people were reported injured in the blast. TEPCO and NISA announced that four TEPCO employees, three subcontractor employees, and four Self-Defence-Force soldiers were injured. Six military personnel from the Ground Self Defense Force’s Central Nuclear Biological Chemical Weapon Defense Unit, led by Colonel Shinji Iwakuma, had just arrived outside the reactor to spray it with water and were exiting their vehicles when the explosion occurred. TEPCO claimed that there was a small but non-zero probability that the exposed fuel assemblies could reach criticality. The BBC commented that criticality would never mean a nuclear explosion, but could cause a sustained release of radioactive materials. [quote]American nuclear engineer Arnold Gundersen, noting the much greater power and vertical debris ejection compared to the Unit 1 hydrogen blast, has theorized that the Unit 3 explosion involved a prompt criticality in the spent fuel pool material, triggered by the mechanical disruption of an initial, smaller hydrogen gas explosion in the building. On 11 May, TEPCO released underwater robotic video from the spent fuel pool. 10:00 JST on 16 March, NHK helicopters flying 30 km away videotaped white fumes rising from the Fukushima I facility. Officials suggested that the Reactor 3 building was the most likely source, and said that its containment systems may have been breached. The control room for Reactors 3 and 4 was evacuated at 10:45 JST but staff were cleared to return and resume water injection into the reactor at 11:30 JST. 16:12 JST, Self Defence Force (SDF)Chinook helicopters were preparing to pour water on Unit 3, where white fumes rising from the building was believed to be water boiling away from the fuel rod cooling pond on the top floor of the reactor building, and on Unit 4 where the cooling pool was also short of water. The mission was cancelled when helicopter measurements reported radiation levels of 50 mSv. 21:06 pm JST, the government reported that major damage to Reactor 3 was unlikely but that it nonetheless remained their highest priority. Early on 17 March, TEPCO requested another attempt by the military to put water on the reactor using a helicopter and four helicopter drops of seawater took place around 10:00 JST. The riot police used a water cannon to spray water onto the top of the reactor building and then were replaced by members of the SDF with spray vehicles. On 18 March, a crew of firemen took over the task with six fire engines each spraying 6 tons of water in 40 minutes. 30 further hyper rescue vehicles were involved in spraying operations. Spraying continued each day to 23 March because of concerns the explosion in Unit 3 may have damaged the pool (total 3,742 tonnes of water sprayed up to 22 March) with changing crews to minimise radiation exposure. Lighting in the control room was restored on 22 March after a connection was made to a new grid power supply and by 24 March it was possible to add 35 tonnes of seawater to the spent fuel pool using the cooling and purification system. On 21 March grey smoke was reported to be rising from the southeast corner of Unit 3 – where the spent fuel pool is located. Workers were evacuated from the area. TEPCO claimed no significant change in radiation levels and the smoke subsided later the same day. On 23 March, black smoke billowed from Unit 3, prompting another evacuation of workers from the plant, though Tokyo Electric Power Co. officials said there had been no corresponding spike in radiation at the plant. “We don’t know the reason for the smoke”, Hidehiko Nishiyama of the Nuclear Safety Agency said. On 24 March three workers entered the basement of the turbine building and were exposed to radiation when they stepped into contaminated water. Two of them were not wearing high boots and received beta ray burns. They were hospitalized but their injuries were not life-threatening. From 25 March, the source of water being injected into the core was switched from seawater to freshwater. On 25 March, officials announced the reactor vessel might be breached and leaking radioactive material. High radiation levels from contaminated water prevented work. Japan Nuclear and Industrial Safety Agency (NISA) reiterated concerns about a Unit 3 breach on 30 March. NHK World reported the NISA’s concerns as “air may be leaking”, very probably through “weakened valves, pipes and openings under the reactors where the control rods are inserted”, but that “there is no indication of large cracks or holes in the reactor vessels”. As with the other reactors, water was transferred from condenser reservoirs to the suppression pool surge tanks so that condensers could be used to hold radioactive water pumped from the basement. On 17 April, remote control robots were used to enter the Reactor Building and performed a series of inspections. On 27 April, TEPCO revised its estimate of damaged fuel in Unit 3 from 25% to 30%. On 15 May, TEPCO revealed that the pressure vessel that holds nuclear fuel “is likely to be damaged and leaking water at Units 2 and 3”, which means most of the thousands of tons of water pumped into the reactors had leaked. On 23 May, TEPCO reported that Reactor 3 had suffered a meltdown some sixty hours after the earthquake. On 9 June, staff entered the Reactor Building to conduct radiation surveying. On 25 June and the following day boric acid dissolved in 90 tons of water was pumped into the spent fuel pool of Reactor 3. Concrete debris from the March hydrogen explosion of the reactor building have been detected in the spent fuel pool. In June TEPCO discovered that the water in the pool was strongly alkaline: the pH had reached a value of 11.2. Leaching of calcium hydroxide (portlandite) or calcium silicate hydrate (CSH) from the concrete could have caused this. The alkaline water could accelerate the corrosion of the aluminium racks holding the spent fuel rods. If the fuel assemblies would fall, this could lead to re-criticality. In the mean time preparative works began to install a recirculation cooling system at the fuel pool, that should be operational in the first weeks of July. On 14 July, TEPCO began injecting nitrogen into the containment vessel, which was expected to reduce the likelihood of further hydrogen explosions. On 1 July the spent fuel pool was switched from the water-injection cooling system, to a circulatory cooling system. Since 2 July, the Reactor has been cooled using fresh water treated by the on site water treatment plant.